The SIA Close Protection Licence allows the holder to legally work as a close protection operative or bodyguard in the United Kingdom. What is the Close Protection Licence? The Close Protection Licence enables you to work in the private security industry as a bodyguard or close protection operative. The licence is issued by the Security Industry Authority (SIA) and is valid for 3 years. Holders of the Close Protection Licence will be expected to handle high pressure situations and the threat of assault, while providing security for important individuals, including celebrities, politicians and sports stars. To be eligible for an SIA Close Protection Licence, you must be 18 years of age, have the right to work in the UK and have passed identity and criminal checks. Moreover, you will need to be a Certified First Aider (First Aid at Work), have successfully completed the required training course and obtained the linked qualification: Level 3 Certificate for Working as a Close Protection Operative within the Private Security Industry. The Close Protection Course usually takes 16 days to complete. The training course is assessed by multiple choice exams and practical assessments including live drills. The cost of starting a licence application is a non-refundable £220. The SIA will get back to you within 25 working days. In rare cases where extra security checks are required, it may take up to 6 weeks. Note, if you are already an SIA Licence Holder, you will be eligible for a 50% discount. The SIA will verify your identity and run a background check on your criminal record. If you have lived abroad for 6 months or more, you may be required to provide some supporting evidence. Please note, if you have spent 6 continuous months outside the UK in the last 5 years, you will need to supply evidence of a criminal record check. However, if you were serving in the military during this period, parts of your military record covering the stated period will be required instead. You are finally licensed! Your SIA Close Protection Licence is valid for 3 years. For further information about how the application process works, follow our detailed guide SIA Licence Application Process. To apply for the SIA Close Protection License, you must show evidence of having completed the Close Protection Training Course. This is usually in the form of the following qualification: Level 3 Certificate for Working as a Close Protection Operative within the Private Security Industry. For further information about how to apply, refer to our guide on the SIA Licence Application Process. The SIA Close Protection Licence lasts for 3 years and costs a non-refundable fee of £220. If you are paying for your own licence, you can claim tax relief (around £44 at the basic rate). To renew your licence, you will need to return to the SIA website and re-apply for your licence. There are no refresher requirements for this licence, meaning you will not need to complete fresh training to apply. You can begin your licence renewal application 4 months before your current licence is due to expire. Your new licence will only commence after your current licence has expired. In some cases, the SIA allows the individuals who meet licensing criteria for one licensable activity to carry out other related licensable activities. For example, individuals who hold the Close Protection Licence can work as Door Supervisors or Security Guards. For further information, see the SIA's Website on Licensing Integration. Q. How much does the SIA Close Protection Licence cost? The SIA Security Guard Licence costs a non-refundable £220. This is paid directly to SIA, who are the licensing authority for the security industry. Please see the following answers if you are self-employed or currently hold a separate SIA Licence. Q. I am paying for my own SIA licence, can I claim back the cost? If you are self-employed and have paid for your own licence fee, you can claim back £44 (calculated for basic rate taxpayers). Q. Is there a discount if I already hold an SIA Licence and am getting an additional licence? 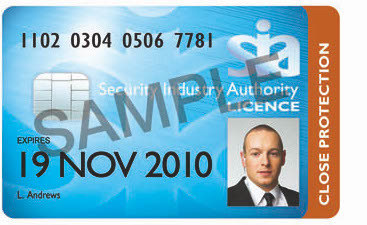 If you currently hold an SIA licence in a separate category and are obtaining an additional licence in another, you are eligible for a 50% discount. For example, if you hold a Door Supervisor Licence and are obtaining a Close Protection Licence, you will only pay £110, instead of £220. Your SIA Close Protection Licence is valid for 3 years. Once it expires, you will need to reapply. You can start this process 4 months before it is due to expire. This will not affect the duration of your current licence or your new licence. The cost is the same as for a new licence: a non-refundable £220. There are currently no refresher courses required. Q. Am I eligible for the SIA Close Protection Licence? To be eligible for an SIA Close Protection Licence, you must first be over 18 years of age, be allowed to live and work in the UK and have passed the necessary criminal checks. Next, you will need to be a Certified First Aider (FAW). This is often covered by your Training Provider. Finally, you will need to have successfully completed and passed the Close Protection Training Course, which will provide you with a Level 3 Certificate for Working as a Close Protection Operative within the Private Security Industry. Q. What is the Close Protection Training Course and how long does it take? The Close Protection Training Course takes you through topics that are essential to providing security for individuals and handling high-stress situations. It runs over 16 days some of the additional areas covered include Evasive Driving, Short Firearms and Close Combat. The training course and the attached qualification (Level 3 Certificate for Working as a Close Protection Operative within the Private Security Industry) is required in order to apply for the SIA Close Protection Licence. Q. What does the SIA check when applying for a Close Protection Licence? Q. I have a criminal record - will this affect my SIA application? Having a criminal record does not necessarily prevent you from obtaining an SIA Licence. However, this will depend on the type of offence. It is best to contact the SIA directly if you are considering applying for a licence. It is also worth noting that a criminal record could cause the SIA to take longer to process your application as they would need to run extra checks. Q. I have spent 6 months or more abroad, will I need to do anything for my SIA application? If you spent at least 6 continuous months within the last 5 years, then you will need to produce some supporting evidence regarding your Criminal Record for your SIA application. For example, you will need to provide some evidence of a criminal check which covers this period. However, if you were serving in the military during this period, then an extract of your military record (which covers the mentioned period) will be enough. The SIA states that it takes 25 working days to process a licence application. In rare cases where there may be issues with identity checks or there are some questions about criminal records, it could take up to 6 weeks. Q. What kind of work can I do with the SIA Close Protection Licence? With the SIA Close Protection Licence, you can work as a Close Protection Officer, or bodyguard and provide security for important individuals like celebrities or businessmen. Using your licence, you are also able to perform many other roles in the security industry, as the skills are transferable and the SIA permits this type of Licence Integration (please see below). Q. What is Licence Integration and how does it work? Licence Integration is where one licence can be used in another related area. For example, a Close Protection Licence can used where a Door Supervisor Licence is required. This depends on the licensable activity being carried out and the licence held. It is a criminal offence on both your part and the employers to work in the private security industry without an SIA Licence unless your employer has been give the necessary exemptions under Section 4(4) of the Private Security Industry Act 2001.